Image of the Wire Quadrifilar Helix self phased backfire. The self-phased backfire QHA has typical application in areas such as satellite communications, as it radiates a cardioid-shaped beam – something very desirable for ground-based GPS receivers. 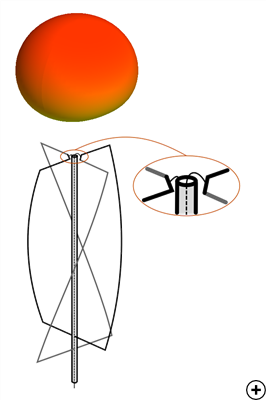 The antenna is similar in structure to the standard self-phased QHA already available in Antenna Magus, but is designed to achieve a backfire radiation pattern. This backfire QHA is often mounted on top of a supporting post - which may be formed by the outside of a rigid coaxial feed cable. 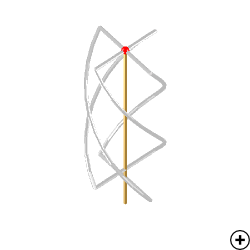 The feed point is at the top of the structure, with all arms spiraling downward and shorted to the supporting post. Backfire radiation is achieved by the correct phasing between arms. Typical circular gain pattern at the center frequency and detail of the feed connection.